JJEES is an International Peer-Reviewed Research Journal, Issued by Deanship of Scientific Research, The Hashemite University, in corporation with, the Jordanian Scientific Research Support Fund, the Ministry of Higher Education and Scientific Research. Jordan Journal of Earth and Environmental Sciences (JJEES) is an international quarterly peer-reviewed research journal issued by the Ministry of Higher Education and Scientific Research, Amman, Jordan. JJEES is published by the Deanship of Scientific Research, The Hashemite University, Zarqa, Jordan. 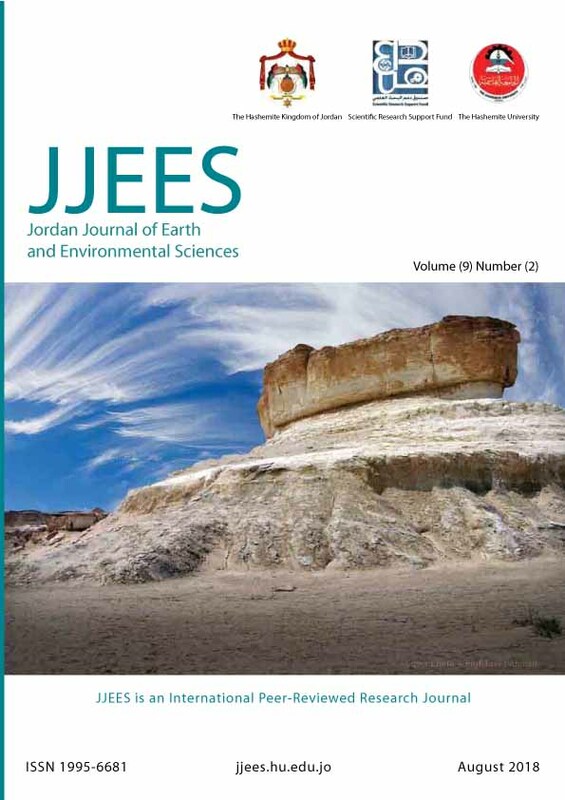 The JJEES publishes new and original research articles, short communications, and review articles encompassing all fields of earth and environmental sciences, written in English or Arabic. Submitted manuscript should not have been previously published or submitted for publication elsewhere while they are under consideration by JJEES. Research articles, communications, and technical notes are subject to critical review by competent referees. Manuscript submitted in Arabic should be accompanied by abstract and keywords in English. The manuscript should be printed on one side of the paper, be double-line spaced, have a margin of 30 mm all around, and no more than 30 pages (7,500 words, font size 12). Authors should submit their articles by e-mail. The title page must include the full title and the names and affiliations of all authors (first name, middle name and last name). Also, their addresses, including their e-mails, and their ranks/positions must be included. Give the full address, including e-mail, telephone and fax, of the corresponding author . The manuscript must contain the title and abstract, keywords, introduction, methodology, results, discussion, and recommendations if necessary. The system of international units must also be used. Scientific abbreviations may be used provided that they are mentioned when first used in the text. Include the name(s) of any sponsor(s) of the research contained in the paper, along with grant number(s). A statement transferring copyright from the authors should be provided to the Hashemite University to enable the publisher to disseminate the author's work to the fullest extent is required before the manuscript can be accepted for publication. A copy of the Copyright Transfer Agreement to be used(which may be photocopied) can be found in the first issue of each volume of JJEES. Articles, communications or editorials published by JJEES represent the sole opinion of the authors. The publisher bears no responsibility or liability whatsoever for the use or misuse of the information published by JJEES.